" T H E V O I C E S T U D I O "
Love to Sing & Want to Sing? Singers, Actors, Beginners, Intermediate, Advanced and Professional levels are all welcome. La Voix Studio, "the Voice Studio", is a place where singers come to develop and improve their voices. Students learn how to use their voice by rehabilitating vocal issues, discover great techniques, eliminate vocal breaks, strengthen their voice, expand their range, gain power, balance, and control in their voice. Our philosophy is to teach students how to sing correctly while preserving the longevity of their voice. We accomplish this by demonstrating and having students practice vocal exercises to control and balance their air pressure, cord closure and vowels. We also teach students audition and performance preparation. 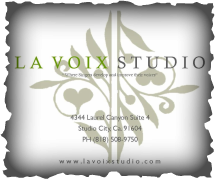 La Voix Studio opened in Studio City to support, outreach and give back to the community by facilitating opportunity through vocal scholarships for youth and adult singers. The celebrity studio houses great vocal talent as well as world class musicians who wish to continue to spread the wealth of knowledge of a balanced voice and musical technique among others. On site at our studio in Studio City California, we offer: Private Voice Lessons, Group Sessions, Master Classes, Introductory Music Theory Classes, Sight Reading Classes, Sight Singing Classes, Harmony Classes, Singer's Performances Classes, Introductory Workshops, Online Private Vocal Lessons, Private Piano Lessons, Drum Lessons, Acoustic Guitar Lessons, Electric Guitar Lessons, Bass Guitar Lessons, and Trumpet lessons etc...click for information on our classes. We also offer private online vocal and music lessons with an Instructor to teach students anywhere in the world through Skype and provide programs off site where a vocal coach or music instructor can travel to your recording session in a recording studio, teach music classes and or speeches at your school/organization or give private music lessons in your home. CONTACT OUR STUDIO FOR AVAILABILITY TO SCHEDULE YOUR FIRST LESSON, CLASS SCHEDULES AND INQUIRE ABOUT OUR RATES. Last year, we had a Spring Jazz Show, this year it's a 50s & 60s Themed Show featuring a live band! Click for more ticket details, Event Gallery, pre-order Show Film or Buy Tickets today until April 30th! SAT Sept 28th at 4pm - 6pm: SHOWCASE, lite Refreshments served, all are welcome, see Performances, brings Friends & Family, meet & greet Teachers, mix, mingle & meet other students. Click to RSVP for Open House or click to Volunteer for our next Event. Thank you all for your support!!! Our 8th Annual Dec Event was fabulous! Stay tuned for our 9th Annual Winter Event on Sunday December 8, 2019. Photos from "The Dreamseekers Musical" Workshop Production and its Closing Night. Stay tuned for more on the New Musical!!!!! WANT TO BECOME A SPONSOR FOR SCHOLARSHIPS, PLEASE CONTACT OUR STUDIO OFFICE FOR MORE INFORMATION. Enroll in the next classes today! ARE AVAILABLE FOR PURCHASE. KNOW SOMEONE WHO WANTS MUSIC LESSONS...GIVE A LOVED ONE THE GIFT OF MUSIC FOR THEIR BIRTHDAY OR SPECIAL HOLIDAY. are also available...click here for more information about our quarterly vocal scholarships that are offered throughout the year and/or to apply online today, click student scholarships. Please take a look and keep visiting our Studio Blog or Online Newsletter for updates or the Latest News on Student Live Performances or Appearances, new TV Shows, New Music Releases, or Studio Events. 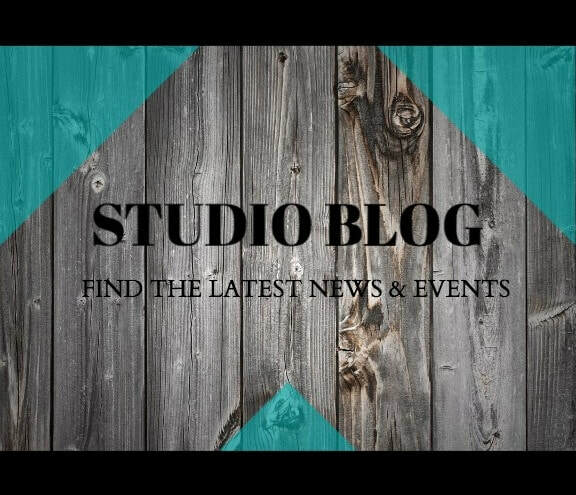 Register to receive email updates & our newsletter regarding upcoming events and news about the studio. Shoshana is so great and helpful! Her lessons never leave my voice feeling tired or strained, and I've been noticing improvement already (only 2 lessons in!). Shoshana is also very good at communicating a concept to you. 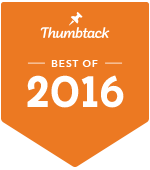 I also find the recordings of each lesson extremely useful!